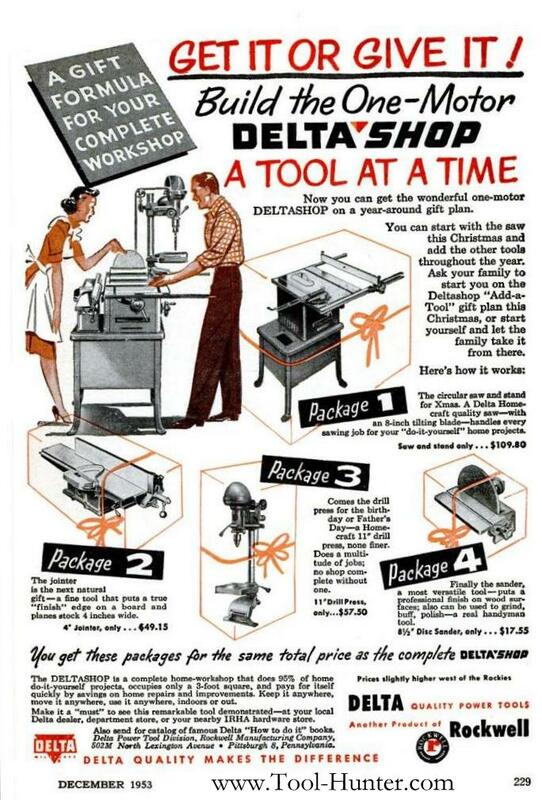 In 1953 Rockwell introduced their response to the Shopsmith tools: the Delta-Shop. Rather than a true multi-purpose tool this was actually 3 tools mounted on a single stand. It was a Table Saw, Jointer, Disc Sander and a Drill Press. While the saw and the jointer were mounted in the conventional side-by-side configuration on a common base, was Drill Press is hinged on the right end of the saw table, and when needed it is lifted up and the belt is fished-down through the saw insert and around a pulley which takes the place of the saw blade.